Alan Stubbs today revealed he’ll definitely be making one change to his side for tomorrow night’s Championship match against Morton – recalling Lewis Stevenson for his 300th appearance as a Hibs player. Stevenson had that moment delayed by a one-match suspension as a much-changed Easter Road side took three points off basement outfit Alloa Athletic on Sunday but Stubbs – the 28-year-old’s eighth manager – is determined he won’t have to wait a minute longer to become only the 32nd player in the club’s history to hit that landmark. Hailing Stevenson’s achievement, the head coach said: “Tomorrow night is going to be a great occasion for Lewis. He’ll come straight back into the side – there’s no doubt about that. He will definitely be making his 300th appearance. “To play so many games at the one club is rarely seen nowadays the way the game has gone. There’s a turnaround not just in players but managers as well which gives you an uncertainty, you are not too sure if the next manager is going to like your strengths. 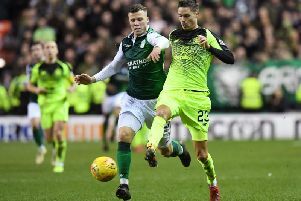 Stubbs, who handed Stevenson a new two-year contract last summer to extend a stay at Easter Road which stretches back to the days of Tony Mowbray’s time in charge, went on: “Since I have come in, I’ve had nothing but admiration for him. In my time as manager, he has been absolutely first class from the day I walked in up to now. Admitting Stevenson will probably hate the spotlight being thrown on him, Stubbs compared Hibs’ longest-serving player to the quiet man of Manchester United, Paul Scholes. He said: “He reminds me of Scholes, someone who comes in, trains, plays and goes away with none of the limelight stuff. “He’s just that way inclined and that’s similar to Scholes. “Lewis just goes about his football and his life in his own way. “He’s a very quiet guy in the background. He has his own way and every player respects that and loves him for what he is.